I know I said that I wouldn’t be baking anything on Saturday for Valentine’s Day, but… I lied? 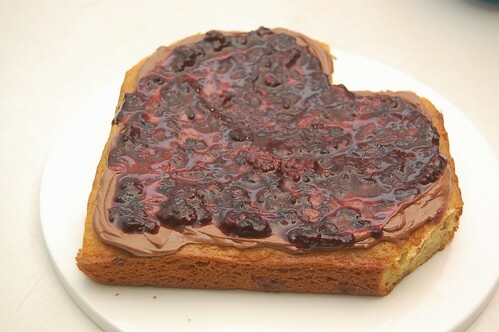 I saw one too many Tastespotting photos of heart-shaped desserts and I just couldn’t take it anymore! Usually when I make cakes, I don’t worry too much about decoration. Spending a long time on decorating a cake seems onerous to me. I’d rather focus on the ingredients and the taste; I’m satisfied with simple decoration, like a few fresh flower blooms on a smooth frosted cake. 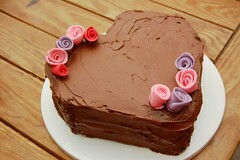 But on Friday night/Saturday morning I decided to bake a heart-shaped cake, focusing on decoration. 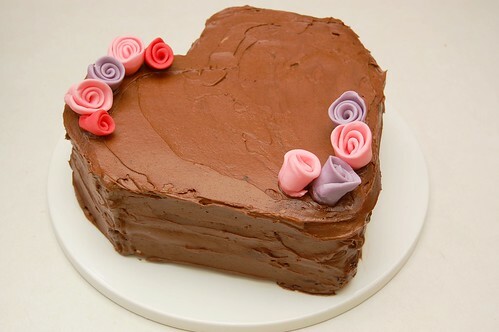 I planned to make two 8×8 square cakes and cut them to the shape of a heart – I didn’t want my husband’s head to explode by buying a heart-shaped cake pan (I have, um, a few specialty pans). 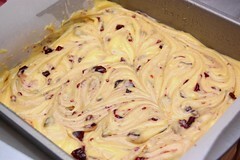 To make the cake batter, I adapted a recipe for Cherry Cheesecake Cupcakes from Cupcakes! From the Cake Mix Doctor by Anne Byrn (a good book if you’re looking to move past box cake mixes but still not quite ready to bake completely from scratch). I combined one package of plain yellow cake mix, vanilla instant pudding mix, whole milk, vegetable oil, eggs and almond extract. 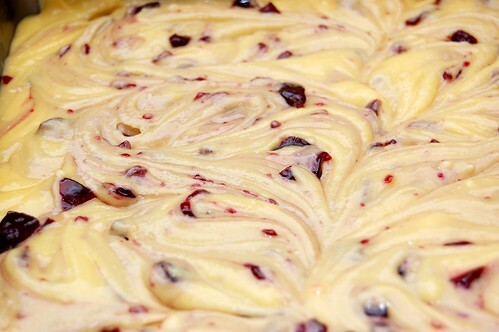 I lined the pans with parchment paper and poured the batter into the cake pans, swirling 3/4 of a jar of blackberry preserves into the batter. I cooled the cakes for 15 minutes in their pans, lifted them out by holding on to the parchment paper and then chilled them in the refrigerator overnight (to make sure they were firm enough to work with easily). 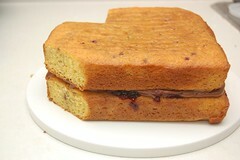 The next morning I gently stacked the cakes on top of each other and cut a small square off of one corner to make the dip of the heart and trimmed the points off. Then I cut the corners off of either side, to make the sides of the heart less pointy. I then carefully removed the top cake and set it aside. 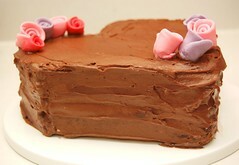 I made a simple chocolate buttercream frosting, also from the Cake Mix Doctor book. 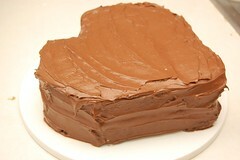 With a thin layer of chocolate buttercream, I frosted the top of the bottom cake, leaving a little extra frosting around the edges (the outline of the heart) to make a sort of pool. I mashed 1 cup of fresh blackberries with a few spoonfuls of confectioners’ sugar (or you could use more blackberry preserves) and spread it on top of the chocolate buttercream frosting. I lightly frosted the bottom of the top cake with buttercream frosting so that the top cake wouldn’t get soggy from sitting on top of the blackberry preserves. 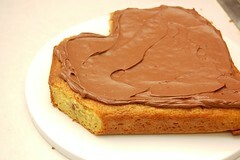 I then set the top layer on top of the bottom cake. I finally frosted the entire cake with the chocolate buttercream frosting, setting the cake in the freezer when I finished. After 15 minutes, I removed the cake from the freezer and refrosted any areas that needed to be smoothed or where crumbs had gotten into the frosting (this wasn’t much of a problem since I had refrigerated the cakes overnight before frosting). I bought some Wilton fondant, tore off a few pieces of it and separated it into separate bowls. I let one drop of food coloring on each and massaged it in to create the colored fondant. I worked it into a thin layer and then gently rolled it to make the fondant flowers. My husband and I really enjoyed this cake, and of course, I was really proud that I had the patience to work on my cake decorating skills! So keep this post in the back of your mind if you have an anniversary coming up or even a kid’s birthday. It’s actually not terribly time consuming, and it’s a lot of fun! I hope everyone had a good Valentines Day weekend and that you’re rip-roaring ready to go for another week (blah, I just made myself sad). It doesn’t matter what takes place over the weekend, I always find myself with a few too many items on the ol’ to-do list when Sunday rolls around. Because of this I often find myself doing something quick and dirty for dinner. Of course, that’s no excuse to fall back on Hamburger Helper. I was feeling a bit uninspired Sunday. I really just wanted something simple, quick and filling so I pulled out a cook book I picked up at a book fair but still hadn’t cooked from. (yes, it’s sad. i often under utilize my reading material.) I hadn’t made pasta in a while so I picked a recipe and made a it of modifications. This dish is very simple in preparation and in flavor. 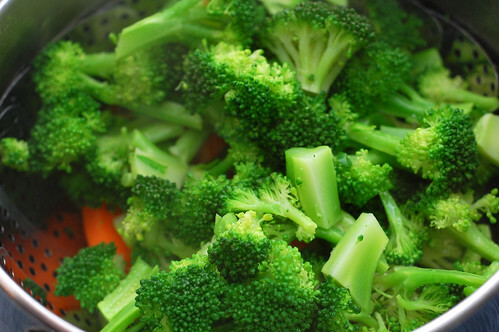 Steam the carrots for 8 minutes, add the broccoli and steam for an additional 5 minutes. Dunk the vegetables in cold water so they stop cooking. Boil you noodles per instructions, strain and set aside. 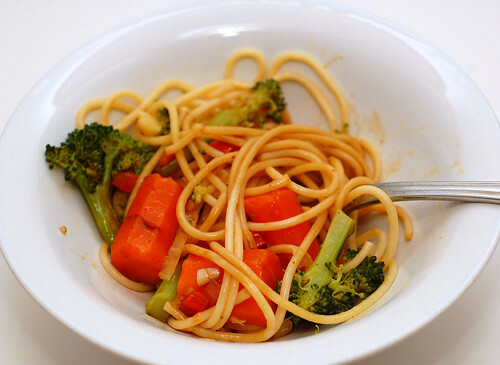 Saute the bell pepper, onion and garlic with the oil for 2 minutes then add your cooked pasta and vegetables. Cook, tossing occasionally until everything is heated through. Serve with soy sauce and black pepper to taste. Kitchen Tips: What are Complete Proteins? As someone who eats a largely vegetarian diet, there are a few nutritional concerns it’s important to be aware of. One of these is the topic of complete proteins. I’ve never really liked the term because it’s not used to describe an actual protein (or collection of proteins). A complete protein is a source of protein that contains an adequate amount of the essential amino acids for our dietary needs. Essential amino acids are ones our body can’t create on its own, and there are generally eight or nine of them, depending on who you ask. You need these things for your health so it’s important to eat a diet that supplies them for you. For omnivores out there, this really isn’t a problem. Just about all animal proteins are considered complete proteins (meat, fish, poultry, milk, cheese, eggs). If you’re a vegetarian, however, then you may not be be getting all you need from your daily milk, cheese and egg intake (I know I’m not). Most beans, grains and nuts are not complete proteins. Fortunately, you take just about any from one category and combine it with another and you’ve got a complete protein. 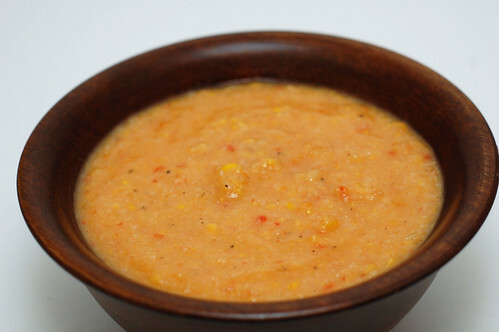 Bean soup with rice, chili with corn bread…. voila! Whole protein. So, if you’re a meat eater, rest easy knowing you’re probably doing ok. If you’re more of a vegetarian like me, then just think about how you’re eating from these three categories. My husband, Morgan, and I have never been big on Valentine’s Day. I generally don’t care for holidays with a lot of expectation involved because they make me nervous! Morgan and I have a great time just going to a low-key restaurant/brewery or sitting in pajamas and watching a movie. But you want me to go somewhere fancy… and dress up… and have it be the most romantic day of the year? Well, I’ll take a rain check! But wait, that doesn’t mean I don’t want a box of chocolate! And you can keep all the gourmet chocolates and truffles; I just want some good old Russell Stover. And maybe it’s because I don’t like all the expectation associated with V-Day, but as of right now I don’t intend to bake anything on Saturday (it’s Russell Stover or bust!). But if you’d like to tempt your honey, I highly recommend this melt-in-your mouth, warm and chocolatey little cake. I found this recipe in an old Kraft foods magazine. 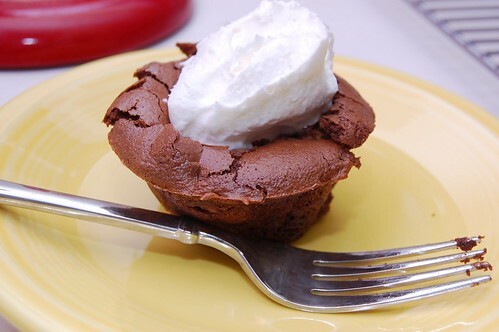 It was described as easy to prepare and, “under 200 calories, wonderful chocolate taste without being overly sweet.” Though I’ve heard people use the phrase “overly sweet,” I can’t say I understand the concept. My mantra is closer to, “bring on the sweets!” so I made a few small changes by adding about 1 cup of peanut butter chips along with 1/2 cup of bittersweet chocolate chips. It’s likely that these are no longer under 200 calories as advertised… whoops! 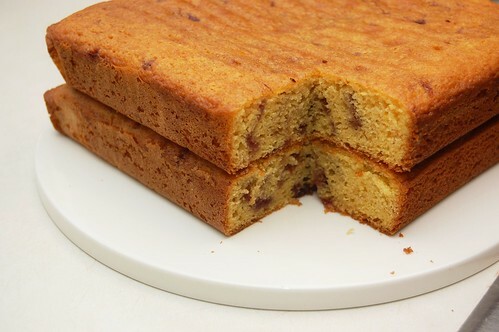 This recipe is also listed on the Kraft website, and I noticed in the comments that a lot of people complained that the cake completely fell in the middle just a few minutes after taking it out of the oven. I had this problem as well, probably because these cakes are flourless so the structure just isn’t the same, but a simple dollop of Cool-Whip disguises that instantly. And because you’re serving it warm out of the oven, they’re really not sitting around long enough for anyone to notice. These little cakes are very easy to whip up, so you don’t have to worry about spending a lot of time in the kitchen instead of with your significant other. And because they’re individual serving sizes you get instant portion control! These sweet little cakes are truly heavenly. 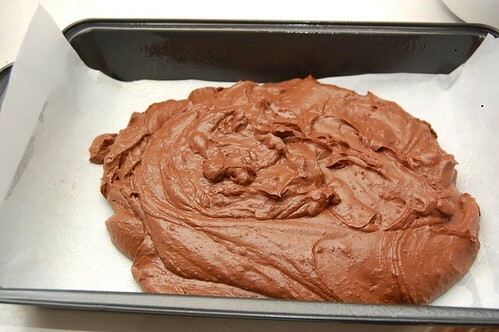 Preheat oven to 350 F. In a microwave safe bowl, microwave semi-sweet and bittersweet chocolate and oil for 20 second intervals, stirring between each interval until melted. Stir in cocoa powder and set aside. Beat egg whites and sugar on high for approximately 3 minutes. Reduce speed and blend in melted chocolate. Stir in peanut butter chips. Spoon batter into 6 paper muffin cups (I decided not to use paper cups when I made them, but I think it would be easier if you did… as I’ll describe in a minute). Bake for approximately 20 minutes, or until center is puffed and set. Let cool in pan for 5 minutes. The tops will fall in as they cool. 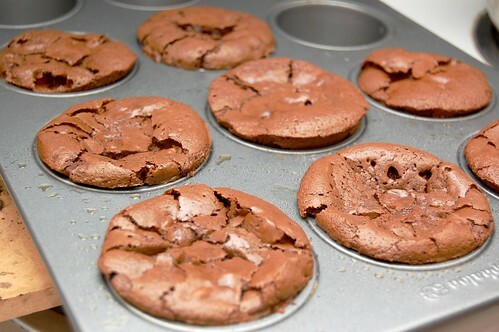 Gently slide out of the muffin pan when cool. Because the tops have fallen, it will be a little difficult to get them out without breaking the top more. Do the best you can, and plop Cool Whip on the rest to serve! As Heather mentioned earlier, a group of us attended Greater DC Care’s MLK Day Of Service a few weeks ago. We all had fun and a few of our party even got lost on the way to the project and saw celebrities (Ashton Kutcher, Demi Moore, and Tobey Maguire). Whenever I organize something like a service project, I try to bring food to give it an extra special touch. It’s just a way of saying thanks and “sweetening” the deal so that they’ll be more inclined to participate in the future. For this event I brought Smitten Kitchen’s whole wheat apple muffins and King Arthur Flour’s Chocolate Muffins. Both were great, but I felt the apple was taking a back seat in the former. And thus, today’s recipe was born. 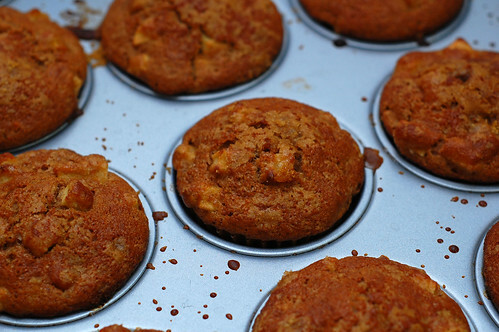 These muffins definitely get you that apple-y goodness. They’re very moist, so if that turns you off consider reducing the amount of apple sauce. Nicole from Baking Bites suggested adding 1/4, but I did not reduce to that this time. Preheat the oven to 450. Line or grease an 18 cup muffin tin and set aside. Reduce your apple sauce in a small pan under low/medium-low heat for approximately 20 minutes. Stir occasionally. Mix together the fours, baking powder, baking soda, salt and cinnamon and set aside. Cream the sugar and butter. Add the egg and mix well, followed by gently mixing the buttermilk in (according to Smitten, the buttermilk will curdle if you over mix) along with the applesauce and yogurt. Stir in the flour mixture and fold in your chopped apples. Divide in your muffin tin cups and sprinkle brown sugar on top, as much as you like (more = better. 1/4 cup total, perhaps?). Bake for 15 minutes and test with a toothpick. Let cool and enjoy. Good lord, so much food was consumed on Saturday. I still feel a little full. Ethiopian kids are probably hungrier because of us. I am proud to state that while I lost to Heather in the sit-up contest I was victorious in “who can last the longest before turning down food” contest. Huzzah! I won’t bore you with the details. Heather covered it pretty well yesterday and really, you’re here for the food, right? The day after I really didn’t feel like eating much; there just wasn’t room. I was also fairly tired after driving back home and taking care of errands. Honestly, at that point food almost seemed like a hassle. I needed to eat something and I needed soup for lunch during the week, so I decided to kill two birds with one stone and try to get to bed early (note: this did not happen). I was browsing through my long list of “want to try” recipes and came across one for potato and corn chowder from a class I assisted at L’Academie de Cuisine. I wanted to make it easier and healthier so I replaced the roux and potatoes with my new best friend the cauliflower. I was very happy with the result. The cauliflower does a decent job of giving you a similar chowder-like texture and I had to use very little milk. Next time I may throw a chopped potato in there for good measure. You know how much I love my veggies. Saute the onion, bell pepper, celery and carrot with the oil in a large pot under medium heat until soft and onions are translucent; approximately 5 minutes. Add the garlic for another minute. 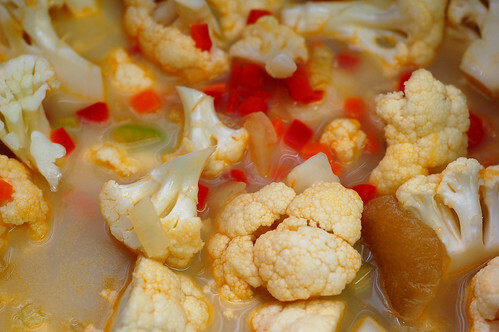 Add the stock/water, milk, cauliflower and spices and simmer until the cauliflower is soft; approximately 20 minutes. 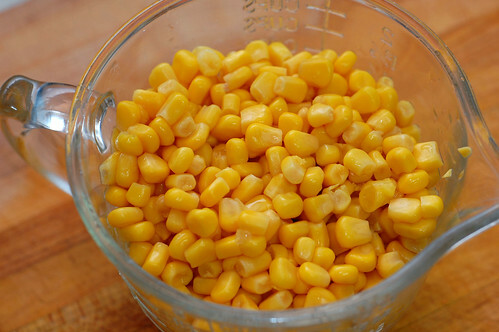 Add corn, salt and pepper and cook for a few minutes so the corn heats up. Then blend with an immersion blender to the desired consistency. Enjoy. As Edwin mentioned on Friday, we were both out of town this weekend for a mutual friend’s birthday party (we had a good time – we went out for a great dinner and then later I beat Edwin in a sit-up contest!). This friend happens to enjoy his chocolate with a side of chocolate, so Edwin and I separately embarked on a mission to create some sinfully decadent chocolate treats for the birthday boy. I decided to make Guinness Brownies, thinking that the Guinness would add extra chocolately richness, making them even more intense. I found a surprising number of recipes for Guinness Brownies, right now I have four of them printed out in front of me from websites like Cookie Madness, Godiva and more. When I began comparing them all they seemed fairly similar. I considered using agave nectar in place of sugar (as a slightly healthier alternative). I also bought some Wilton’s fondant in an attempt to make fondant Miis. But then I remembered a cardinal baking rule that I always violate and usually pay for – never try something new on short notice, especially when you’re making it for someone else. So instead I made minor baking changes and finished the brownies off with silly decorations as a gag for my friend. 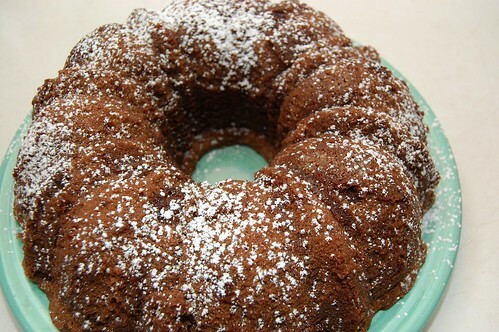 I used half whole wheat flour and half all-purpose white flour, and I amplified the chocolate. I used very dark Ghirardelli chocolate bars and unsweetened cocoa powder. Highly aromatic, this bar has mocha, blackberry and dark cherry notes with an intense chocolate flavor and silky smooth texture. This sensuous chocolate has a long finish and a delightful, lingering flavor. I also used 1 ounce of Ghirardelli “Midnight Reverie,” with 86% cacao. Both of these are seriously dark chocolates, but I wanted to work with the heavy taste of the Guinness. The sugar, white chocolate chips and semi-sweet chocolate chips sweetened the brownies and kept them from being bitter, but the very dark chocolate and Guiness kept them distinctive. I sifted confectioners’ sugar over the brownies when done. This was listed as an optional component in the recipes I found, but I would suggest that it’s mandatory, especially if you’re using super dark chocolate. 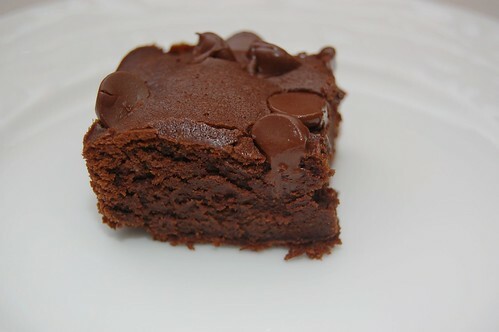 I recommend this brownie if you’re looking to intrigue the chocolate lover who thinks they have tasted it all before. You can’t really make out the Guinness, but the taste is definitely dark. 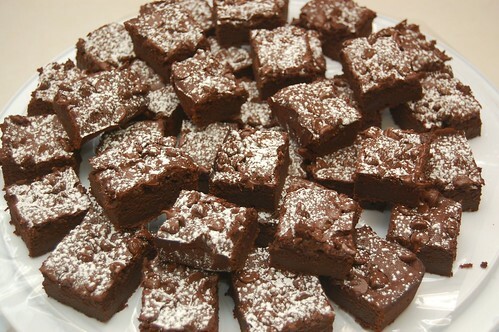 The texture is also very different from a typical brownie – the batter tasted exactly like chocolate mousse, and they came out of the oven very fluffy and light instead of tough or dense. And, don’t underestimate the power of silly toothpick photo decorations. 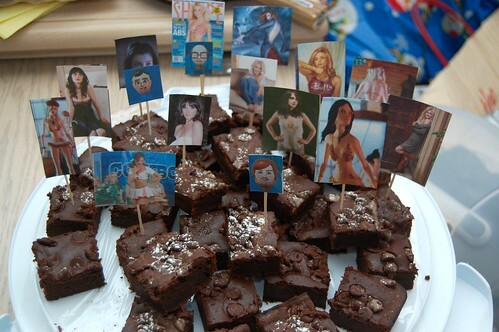 I printed a few of my friend’s favorite things (yes, mostly this means women on tv that he finds attractive), attached the photos to toothpicks, popped them in the brownies before serving, and we all had a good laugh! Preheat oven to 375 F. Line a 9×13 baking pan with parchment paper (with enough hanging out so that you can grab it to remove the brownies). Spray sides with non-stick cooking spray where parchment paper does not cover. 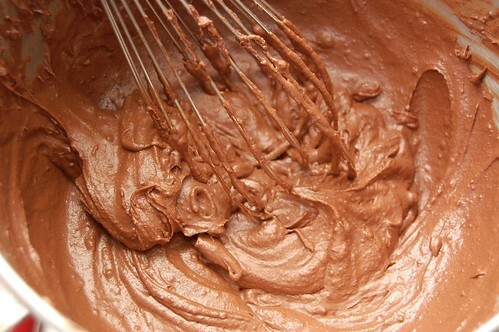 In a medium bowl, whisk flour, cocoa powder and salt. Set aside. Cut butter into cubes. In a microwave safe bowl, microwave Twilight Delight, Midnight Reverie and white chocolate chips (all chopped) with butter for 20 seconds at a time. Stir between 20 second intervals to avoid burning your chocolate. In the bowl of a stand mixer with the paddle attachment (or in a large bowl with a regular mixer), beat eggs and sugar on high for 3 minutes. 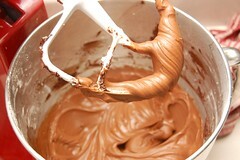 Gradually add melted chocolate mixture. Beat until fully combined. Gradually add flour mixture. Spoon foam off of Guinness and gently whisk the beer into the batter, then add vanilla. (The Cookie Madness instructions say that the batter will seem thin, but my batter was thick although fluffy like mousse). 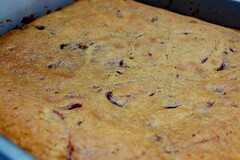 Pour batter in your baking pan and level with a spatula. Bake approximately 28-30 minutes in the center rack of your oven, or until a toothpick inserted in the center comes out almost clean. The top of the brownies should be set. 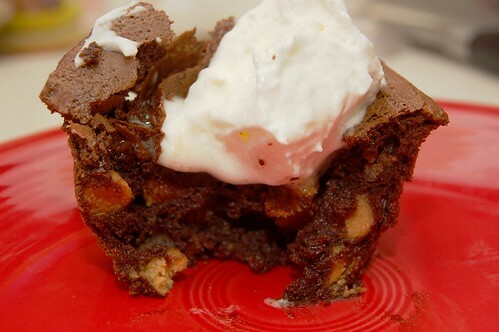 Let brownies cool in pan for 10-20 minutes, then carefully lift brownies out of the pan by holding parchment paper. Allow brownies to cool completely on wire rack. Dust with confectioners’ sugar before serving. Kitchen Tips – Butter, Butter, Who's Got the Butter? One of the first “lessons” I learned in baking was about butter. When I was first starting out I always microwaved butter to soften it. Who wants to let the butter sit out and just wait for it to get to room temperature? Usually the things I made seemed to turn out alright, and I didn’t worry about it. Then I started reading more about baking and everything I read cautioned against microwaving butter. I began noticing that the things I made were not really alright – they were on the flat side and they often spread too much. 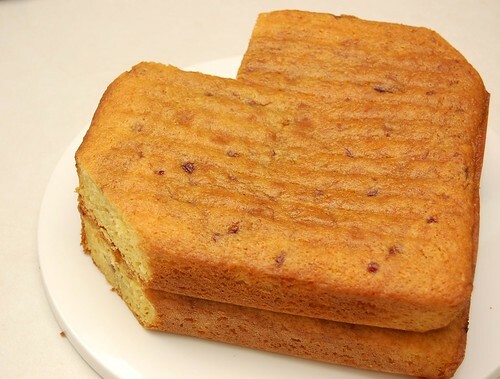 Butter gives baked goods their structure. If the butter gets too warm or melts, the emulsion breaks and you’ll never get that structure back. 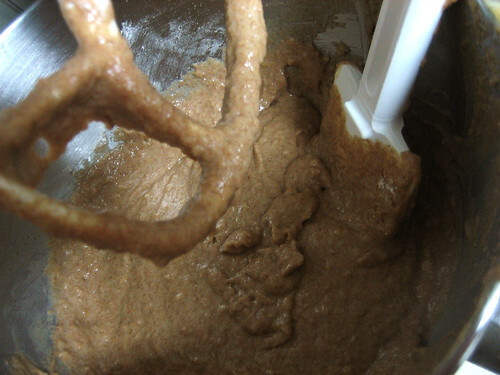 The butter will also never add air pockets to your batter or dough, which affects the texture. I know some people will probably protest that they’ve been microwaving their butter for years without a problem. I haven’t even been able to convince my own mother to stop microwaving butter. I’ll write a future “Kitchen Tips” post about what it really means to “cream butter” in recipes and then you’ll see what I mean… it’s a beautiful thing when done right! If you’d like to read more about the importance of butter’s temperature, check out this great article from NYTimes.com. Some of it is a bit extreme, but the important thing to take away is to let your butter sit out until it reaches room temperature (about 65 degrees) on its own. The time will vary based on the temperature of the butter to begin with, but I usually let mine sit out for about 30 minutes. Make sure you don’t let it melt! 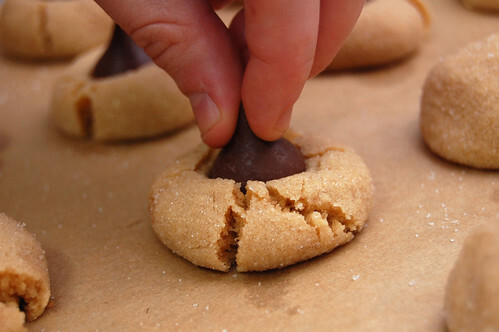 (Photos: The first photo shows peanut butter blossoms from the Bake-a-Thon made with room temperature butter. 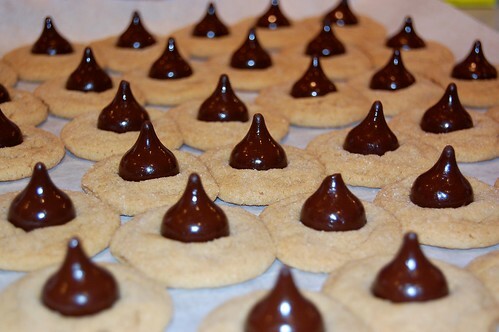 The second photo shows peanut butter blossoms made with microwaved butter when I was home for this past Christmas). Comments Off on Kitchen Tips – Butter, Butter, Who's Got the Butter? Both Heather and I will be traveling to our hometown of Richmond this weekend to celebrate a mutual friend’s birthday. Much fun will be had, much food will be consumed. Besides the obligatory mass of baked goods that come from two culinary freaks (Heather lives for days like these, I swear), our friend has requested dinner at Texas De Brazil; also known as “oh god why did I eat so much it hurts so good.” I don’t eat meat that often and beef even less frequently, so I can assure you that I will make this experience worth it. The Lady Friend and I both have pretty active (read: busy) schedules so quality time can be a bit limited. With my weekend trip we had dinner Monday to have some of said quality time. She had recently got me Fresh Food Fast: Delicious, Seasonal Vegetarian Meals in Under an Hour and so far I’ve been pretty happy with it, so we decided to make black bean quesadillas. 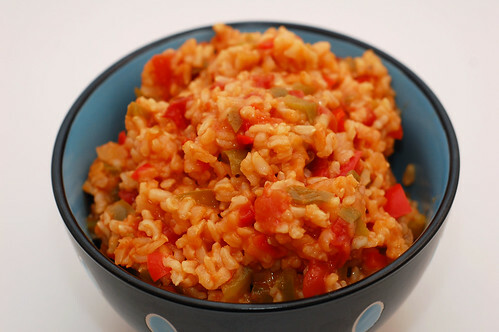 I did a little searching for Mexican rice recipes and was surprised to find very few called for much in terms of spices. At that point I decided to wing it and this was the result. It went quite well. 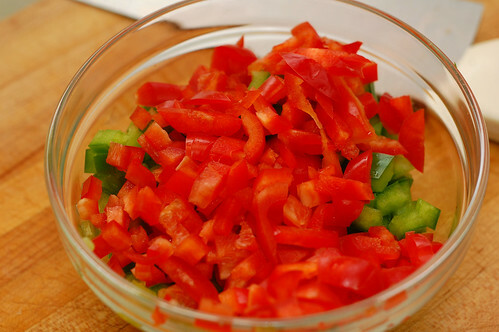 Heat the oil in a medium-sized pot and saute the onions, garlic and peppers until softened; approximately 3-4 minutes. Add the remaining ingredients and simmer until the rice is softened; approximately 45 minutes.